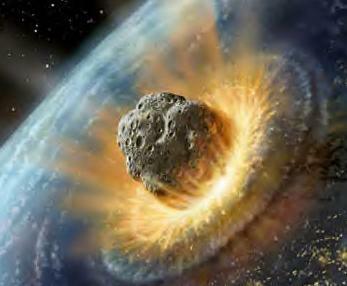 The impact of a kilometer-sized asteroid with the earth, such as the one shown here in an artist's conception impacting off the shore of Southern California, could release an amount of energy equivalent to a million nuclear warheads, leading to the extinction of most large lifeforms on earth. The Near Earth Asteroid Reconnaissance Project (N.E.A.R.) is a world-wide network of amateur astronomers and space scientists involved in the discovery and determination of the orbits of near-earth asteroids or more generally near-earth objects with possible earth-crossing orbits. 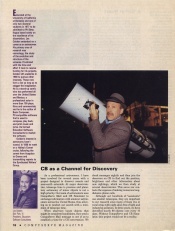 It takes advantage of the world-wide network of amateur astronomers who, equipped with modest telescopes with CCD detectors, guidance capability, and personal computers, are able to perform professional quality work in their own backyard observatories, together with professional astronomers at small observatories. It was developed by astronomer Dr. Leslie M. Golden while he was a professor at the University of Illinois at Chicago. Its goals are to identify such objects to further the study of space science and to identify those that may be on collision path with earth to avoid catastrophic impact events such as those that led to the Tunguska event in Siberia and the mass extinction associated with dinosaur extinction by employing future avoidance strategies. N.E.A.R.’s administrative and research offices are in Oak Park, Illinois. The N.E.A.R. Project was created and developed in 1994 by Leslie M. Golden when he was a professor in the physics department at the University of Illinois at Chicago. Among other activities, Dr. Les Golden was to be announced as a member of the second resident crew of Biosphere 2 from which the N.E.A.R. project was to have been directed when that project changed its focus to education rather than research. Any amateur or professional astronomer or team of such with access to a suitably equipped telescope system can join the N.E.A.R. network. Many are active in the Night Sky Network of National Aeronautics and Space Administration (NASA). Nearly all members utilize charge-coupled device|charge-coupled detectors (CCD), typically with dimensions of 2096 x 2096 pixels, rather than photographic images to search for asteroids. After becoming a member of the volunteer network of observers, the astronomer notifies N.E.A.R. by e-mail of the position of a candidate object. From time to time internship opportunities are available with the research group. Astronomy, physics, mathematics, space science, and aeronautical engineering students with an interest in space science and asteroid detection provide programming support, data reduction, preparation of papers for publication, and liaison with the popular astronomical press. The N.E.A.R. project was begun with the realization of the catastrophic result of the collision of a large object with the earth. An object which is 3 km in diameter, composed of material having a density of 5 g/cc (5000 kg/m3), and traveling at 10 km/s, would possess a kinetic energy of ½ mv2 = 3.5 x 1021 joules. The TNT_equivalent|energy yield of the largest nuclear weapons is about 5 x 1015 joules so that one large asteroid possesses the kinetic energy of approximately one million large nuclear weapons. After detecting a candidate object according to recommended procedures and determining an approximate position, the information is sent to the other members of the network to obtain photometric and astrometry|position measurements. The N.E.A.R. staff then determines the orbit of the object, compares that orbit to comprehensive databases of known objects such as the Jet Propulsion Laboratory small body database and the Minor Planet Center database (MPCORB) , and evaluates whether the object was heretofore known or is a newly found object. Discovering asteroids is easily done because of their large proper motion|proper motions, the key to discovering near-earth objects. An object orbiting the sun in the asteroid belt between Mars and Jupiter will typically move about 10 seconds of arc over a 15-minute period. Near-earth objects will have larger proper motions both because they are closer to the earth and because, being closer to the sun, they have larger orbital velocity|orbital velocities. Generally, the closer the asteroid to the earth, the brighter it is and the greater its angular distance of movement between observations. The N.E.A.R. staff determines the orbital elements of the object from observational data, prepares presentations for amateur astronomy groups, and analyzes CCD images to determine the brightness of the object. The N.E.A.R. project complements the professional activities of other near-earth asteroid search projects in being a network of world-wide amateur astronomers and astronomers at small observatories worldwide. The search does not take time from other researches on major international telescopes, but is rather hobby-focused. Search projects at research observatories include NEOWISE Space Infrared Survey, Lincoln Near-Earth Asteroid Research (LINEAR), Near-Earth Asteroid Tracking (NEAT), Spacewatch , Lowell Observatory Near-Earth Object Search (LONEOS), Catalina Sky Survey, Japanese Spaceguard Association (JSGA), Asiago-DLR Asteroid Survey (ADAS), Minor Planet Center, Panoramic Survey Telescope and Rapid Response System, and Spaceguard. This page was last modified on 24 January 2012, at 15:20.